Now the platform can automatically generate REST interface for entire application solution. You publish it in the usual way on the web-server and after that the third-party systems may access your application using HTTP requests. REST interface allows reading the data of 1С:Enterprise, change them, create new objects and delete the existing ones. integration of application solution with corporate systems, probably even without additional programming. Conducting a single document, running business-process. As an access protocol the platform uses the protocol OData release 3.0. This is an opened web-protocol to request and update data. It allows manipulating with data using the HTTP-commands as the requests. It is possible to get the responds in various formats, but we support as yet only the work with data in Atom/XML format. We have implemented in the platform only the server part of REST services. That is, the application solution can automatically deliver its functionality using REST services. To interact with the third-party REST services from 1С:Enterprise (to organize the client part), it is possible to use the tools existing in the platform to work with HTTP: objects HTTPConnection, HTTPRequest and HTTPRespond. Support in the content management systems (CMS): Drupal, Joomla. 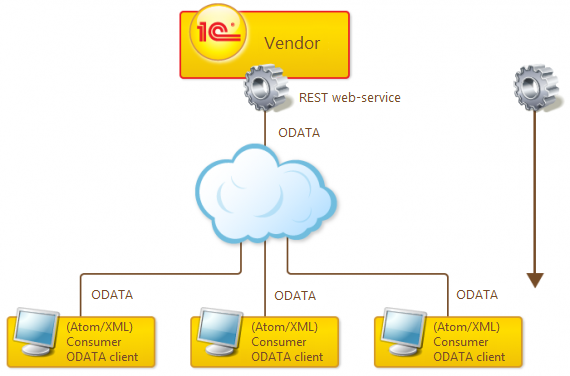 OData clients performs the operations to create, read, modify and delete data of application solution. Almost all the major configuration objects are available in the REST interface: catalogs, documents, constants, enumerations, exchange plans, accumulation registers, calculation, accounting and information registers, virtual tables of periodical information register, accounting and accumulation registers, charts of accounts, characteristic types and calculation types, business-processes, tasks and document journals. Unavailable at the moment are the reports and data processors, commands, selection filters, scheduled jobs, external data sources and users. For calculation register - ScheduleData(), ActualActionPeriod(), <RecalculationName>() and Base<Name of base calculation register>(). In case of an error situation, 1С:Enterprise returns a response with HTTP-status 4XX or 5XX. 4XX status tells about incorrect client actions, 5XX status – about an error on the server. in case of 4XX status, 1С:Enterprise tries to help the client to understand the reason of an error and can send an additional internal error code and information message. When reading and writing data using REST interface, the platform performs all the usual security checks and call the event handlers, except the filling check. When working through the REST interface, an optimistic data lock is supported. When requesting data (of a single object or a list) together with them the platform returns the values of field (fields) DataVersion. In the subsequent requests PUT, PATCH и DELETE with the same data it is possible to send to 1С:Enterprise the version of read data. If the version of data existing in the information base did not change by this moment, the requested action is performed. Thanks to the versatility and cross-platform property, we position the automatically generated REST interface as a basic tool for integration with third-party systems.